Formulated to Apply Directly Over Other Coatings or Direct To Metal (DTM)! Permanent high solids (over 60%) and low VOC's Clear Coat. Ideal for Direct To Metal (DTM) applications - No Additives Needed! Apply directly to Painted Surfaces with Minimal Surface Prep. 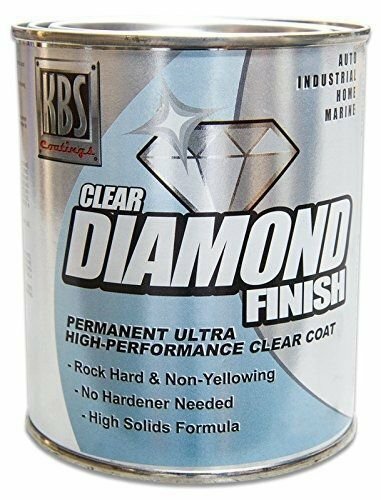 Incredibly tough and hard like no other clear coat on the market. Water clear high gloss clear coat remains permanently flexible and is able to perform in the toughest environments without yellowing, cracking or peeling. Can be applied with a brush (without leaving any brush marks), roller and conventional spray gun. Unlike normal two part coatings, no hardener is needed. You can just stir and go. 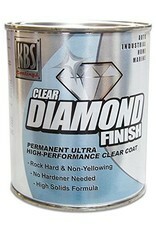 DiamondFinish ClearCoat will cure without heat or UV lights in temperatures from 50° to 86° Fahrenheit. Can be applied directly to a cured Automotive basecoat, Standard solid color paints, and Single Part or Two Part paints. It can also be applied to Non Ferrous metals including Aluminum, Alloys, Brass, Chrome and Copper. Able to withstand the harshest of chemicals including fuels, solvents, Battery acid, Brake fluid, Ethanol, Methanol, MEK, Hydrochloric Acid, Fertilizers, and Acetone. Graffiti Resistant: because of its chemical resistance, grafitti just won't stick and can be removed simply with a solvent soaked rag. Great for high temperature automotive applications including the use on cylinder heads, engine blocks, brake components and even inlet manifolds, without yellowing up to 250° Fahrenheit.